For nearly three decades the James Beard Foundation has celebrated chefs and culinary professionals throughout the restaurant and food industry. It has also advanced “delicious, diverse, and sustainable” food initiatives. So it’s no surprise that the foundation chose the theme “RISE” for its 2018 award ceremony and gala, which will be held at the Lyric Opera of Chicago on Monday, May 7. The intent is to recognize those chefs who have risen to the occasion, “whether to feed those in need, to stand up for what they believe in, to support their local communities, or to express their personal stories through their cooking,” according to the James Beard Foundation. Winners receive a certificate and a James Beard Foundation medallion, but the recognition bestowed by what’s often referred to as the “Oscars of the food world” lasts a lifetime. We spoke with two past Chicago winners — Sarah Grueneberg, executive chef and owner of Monteverde Restaurant, who was awarded the 2017 Best Chef: Great Lakes title; and Carrie Nahabedian, executive chef and owner of NAHA and Brindille, who earned the 2008 Best Chef: Great Lakes title — to get their thoughts on the James Beard Awards and what it means for the city. Grueneberg made her name in Chicago at the award-winning Spiaggia (980 N Michigan Ave), where she was named executive chef in 2010, and went on to launch Monteverde Restaurant & Pastificio in 2015 with business partner Meg Sahs. Monteverde has since become renowned for its refined, contemporary Italian fare, served up in a stylish, rustic setting in the city’s West Loop. Grueneberg’s meteoric rise continued in 2017, when the James Beard Foundation named her the 2017 Best Chef: Great Lakes, and she competed in Top Chef: Texas, where she was a runner-up, and Iron Chef Gauntlet. Grueneberg describes the first few times attending the awards ceremony as a “magical experience.” “It was like walking into a movie premiere and seeing a bunch of celebrities,” she says of seeing many of her culinary heroes. Visit Grueneberg at Monteverde, 1020 W Madison St, West Loop. Nahabedian is executive chef and owner of both NAHA — which is currently in the process of relocating to a “secret location” close to its former site in River North — and Brindille, which she opened in 2013 with her partner and cousin, Michael Nahabedian, in the Gold Coast neighborhood, close to the Magnificent Mile. She says Chicago Mayor Rahm Emanuel’s push to bring the James Beard Awards to Chicago has helped shine a spotlight on the city and, perhaps, played a role in Bon Appétit magazine naming Chicago its 2017 Restaurant City of the Year. She also praises the foundation’s philanthropic work in mentoring and championing diversity, among other issues. Considering this year’s “RISE” theme, says Nahabedian, it’s fitting that the 2018 Humanitarian of the Year Award will go to multiple James Beard Award winner José Andrés, owner of ThinkFoodGroup and founder of World Central Kitchen. Andrés spearheaded an effort to feed victims of Hurricane Maria in Puerto Rico, helping to bring 3.3 million meals to the storm-ravaged region. 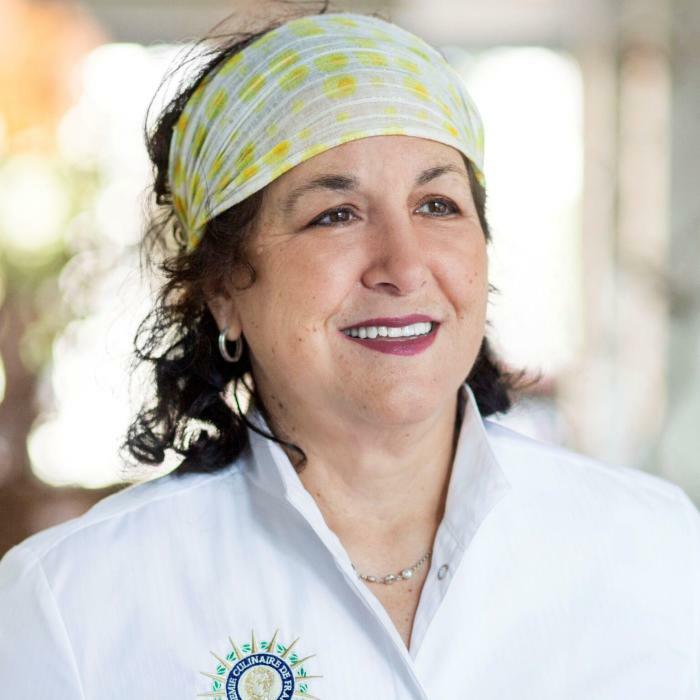 Winner of James Beard’s 2008 Best Chef: Great Lakes title, Nahabedian’s innovative take on the culinary arts, whether dishes with California and Middle Eastern accents at NAHA, or fine French cuisine at Brindle, has secured her as one of the city’s true star chefs. Visit Nahabedian at NAHA’s new location (to be announced) or at Brindle, 534 N Clark St.
Join us for Eats Week! More than 130 restaurants will celebrate James Beard&apos;s culinary legacy and Chicago&apos;s vibrant food scene during James Beard Eats Week. Each participating restaurant creates a customized dish or menu inspired by the James Beard Foundation&apos;s namesake chef, a pioneer of American dining.